“I was aware of how slow I was,” Freedman says. But if the family atmosphere was a bit intimidating at times, it was also highly stimulating. Freedman’s father was a recreational mathematician (who later earned a doctorate in the subject), and by the time Freedman finished high school, he had caught his father’s love of mathematics research. “I don’t think one in a hundred freshmen has any idea what a mathematician spends his time doing, but I did, because of my father,” he says. At his mother’s suggestion, however, Freedman started college at the University of California, Berkeley, with the intention of majoring in art, despite nagging concerns about whether this goal was a good fit. After an unproductive meeting with the art department’s chair, Freedman chose to major in mathematics. Since he came from a family of prodigies, he decided that he could skip the first-year calculus course and its allied subjects, such as differential equations. Instead, he enrolled directly in upper-level courses in abstract algebra, topology and measure theory, a decision that influenced the direction of his research for years to come. Freedman found himself stymied by the math department’s language requirement, however. After just a year, he entered the graduate program at Princeton University, whose language requirements were less rigid. After graduating, Freedman took on visiting positions at Berkeley and the Institute of Advanced Study in Princeton before accepting a tenure-track job at the University of California, San Diego. Robion Kirby, a mathematician at Berkeley, recalls thinking at the time that Freedman was a little lucky to get the job in San Diego, since he didn’t have a big track record yet. The Berkeley math department, which had chosen not to offer Freedman a tenure-track job, had no idea what lay in Freedman’s future, Kirby says. In dimensions three and lower, he observes, the topology of a shape is largely dictated by considerations from geometry, which complements topology by studying the attributes of a shape that do change when the shape gets distorted, such as lengths and angles. In dimensions five and higher, by contrast, a shape’s geometric type no longer significantly restricts the possibilities for its topology. “Dimension four is exactly where geometry and topology are starting to tear away from each other, which leads to very beautiful and complicated subjects on both sides,” Freedman says. Freedman felt convinced that Casson’s construction could be pushed much further, to shed additional light on four-dimensional shapes. For the next seven years, he spent about half of his time working on this challenging research project, spending the rest of his research hours on surer bets. By 1981, Freedman had succeeded in using Casson’s framework to produce what is now considered one of the cornerstones of the theory of four-manifolds: a complete classification of compact four-manifolds that have no holes of a particular type. In particular, his result proved the four-dimensional version of the famous Poincaré conjecture. This version states, roughly speaking, that any compact four-manifold that can be gradually bent, contracted and expanded into a four-dimensional sphere is in fact topologically the same as the four-dimensional sphere. At first, Freedman recalls, his results seemed too good to be true. “It took several weeks for me to be convinced that the story held together,” he says. Electrified by Freedman’s announcement, a group of experts lingered at the conference site for about a week, picking apart the details of his argument. By the end of the week, they had arrived at a verdict: The theorem was correct. Freedman’s work, for which he was awarded a Fields Medal in 1986, comprised one audacious step after another, Kirby says. The result was “the single best piece of mathematics that I was aware of,” Kirby says. “Bar none.” If Freedman hadn’t seen how to work through the different chunks of his argument, according to Kirby, his classification result might well still be an open problem today, more than three decades later. After achieving his landmark result, Freedman decided to go back and fill in the gaps in his mathematical education. “After I got the Fields Medal, I was viewed as somehow representing mathematics, and it was a little silly not to know any, so to speak,” he says. Freedman became a fount of insight and information, Walker says, both because his interests became so broad and because he had a knack for getting to the heart of a subject. “If you wanted a five-minute summary of a 60-page paper, I don’t know anyone better than Mike for saying, ‘Here are the core ideas of the paper,’” Walker says. In 1988, Freedman attended what he calls a life-changing seminar at Harvard University on the recent work of Edward Witten (now at the Institute for Advanced Study in Princeton), who linked the topological theory of knots and links to an area of physics now known as topological quantum field theory. Freedman had recently learned that calculating the “Jones polynomial” of a knot or link is an extraordinarily hard computational problem, but one whose solution would in turn provide solutions to many other hard computational problems. Witten’s work seemed to suggest that certain physical systems calculate Jones polynomials instantaneously. “I was immediately fascinated with the idea that you should try to build a computer that was based on whatever physics Witten was talking about, and then it would be able to solve these marvelously complicated problems,” he says. Freedman dived into the subject over the decade that followed, painstakingly studying the relevant physics. “I still speak physics with an accent,” he says. Freedman’s graduate students got to witness this process of self-education firsthand, recalls Slava Krushkal, a former Freedman student now at the University of Virginia. 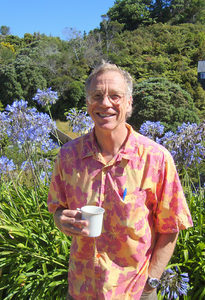 Freedman held four topology and physics seminars each week for his graduate students, during which he would often lecture about whatever he was working on at the moment. “He would think about something and then he would give a lecture — it wasn’t always correct, but it was a great way to see how someone like Mike thinks about things,” Krushkal says. In 1997, Freedman accepted a job at Microsoft, and since 2005 he has directed Station Q, a Microsoft outpost dedicated to research in topological quantum computing. Freedman is an avid rock climber and mountaineer, and stories abound of his daring — but always carefully considered — exploits. “On at least three occasions I can think of, he has snapped tendons just by straining too hard,” says Walker, who has joined Freedman on many outdoor adventures. “His outdoors personality is a mirror of his math personality, which is very tenacious.